The new Spire is a versatile and extraordinarily agile tractor which offers all the capabilities you need to make working in both the field and around the farm simpler and easier with unmistakeable Lamborghini style and character. Spire is equipped with new FARMotion engines that ensure power and lower consumption, respecting the environment. Forms with no sharp corners or edges describe a compact, clean surfaced structure. With superior quality soundproofing and anti-vibration materials used to insulate the interior of the cab from external noise and vibration, the cab of a Spire tractor is a comfortable and pleasant place to work.Each detail reveals the care that was taken to transmit the quality and sophistication typical of the Lamborghini Trattori brand. The new Spire adopts a three or four cylinder latest generation FARMotion engine, specially designed for farming, which is defined by narrower width and less noisiness and consumption. In fact, the new shape of the heads and the combustion chambers—with 2,000-bar Common Rail Bosch system—improves the gasoline combustion process, optimising engine potential and using the least amount of fuel. A combined aftertreatment system with EGR (exhaust gas recirculation) circuit and a DOC (Diesel Oxidation Catalyst) ensures compliance with Stage III B emissions regulations. The versatility, efficiency and practicality of Spire are also seen in the drive, with a total of 10+10 gears, which can be increased to 30+15 thanks to the underdrive. With the three-ratio Powershift, without using the clutch, you can reach one of the 45 available speeds, both going forward, and backing up. The Stop&Go system of the hydraulic reverse shuttle also allows you to stop the tractor and start going again fluidly and without jerking, making work easier both in the barn and in haying time. Spire's quality of operation also distinguishes itself on the road thanks to Overspeed technology, which lets you reach 50 km/h, with 40 km/h cruise control. For unrivalled efficiency and to maximise the performance of the implements used, the new Spire family is offered with an open centre hydraulic system with a 54 or 42 l/min pump, and with 6-way auxiliary distributors with flow regulator. The rear lift, which is also offered as an electronically controlled variant, has a maximum capacity of 3.600 Kg, while the optional 2.100 Kg front lift comes complete with a dedicated front PTO for working effectively with a range of front-mounted implements. The PTO, offered with mechanical or electrohydraulic control and as a ground-speed variant, makes it possible to work productively and cost-effectively with any implement. The new Spire possesses all the perks that define it as an authentic Lamborghini. 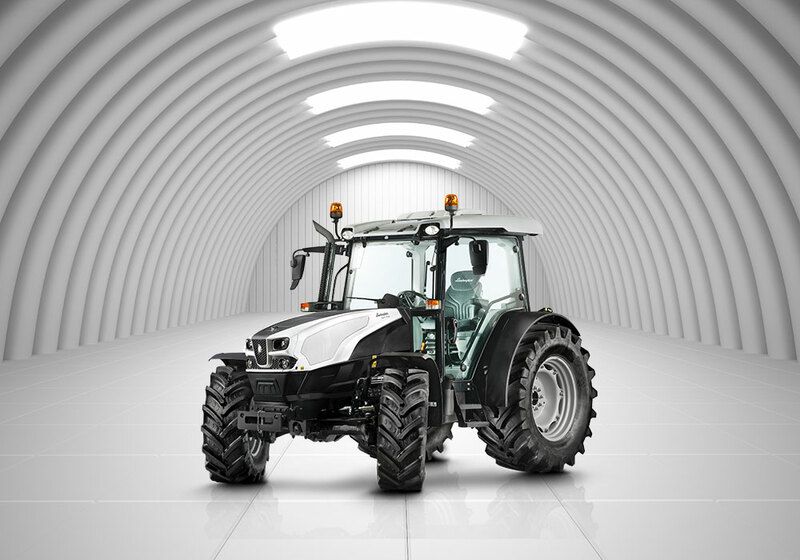 With its high visibility roof and just 4 pillars, the cab offers perfect control in all directions. The drivers seat is equipped with air suspension to perfectly adapt to the weight and height of the driver and distinguishes itself for its great comfort. All the controls are arranged ergonomically in a colour-coded layout within easy reach of the driver.